The secret to this dish's success is to use firm tomatoes, such as those sold on the vine. Roast them on a rack near the top of the oven. Cut tops from tomatoes about 3/4 in. from stems (keep leaves and small stems attached) and set aside. Working over a food processor and using a teaspoon, carefully scoop out tomato pulp and juices, leaving only the outer walls. Purée pulp and juices, then measure; you should have 2 cups. Trim a very thin slice from base of tomatoes so they sit flat (if you get a hole, patch from the inside with a tomato slice). Heat 3 tbsp. oil in a medium saucepan over medium heat. Cook onion and garlic, stirring occasionally, until lightly browned, about 5 minutes. Add rice, kosher salt, pepper, and chile flakes, stirring to coat. Stir in tomato purée and 1/4 cup water. Cook uncovered, stirring occasionally, until liquid is reduced to the surface of rice, 8 to 10 minutes. Reduce heat to medium-low, cover, and cook, stirring once or twice, until rice is cooked through, about 15 minutes. Meanwhile, preheat oven to 450° with a rack in the top third of oven. Grease a shallow baking dish with some of remaining oil. Stir parsley, basil, and cheese into risotto. 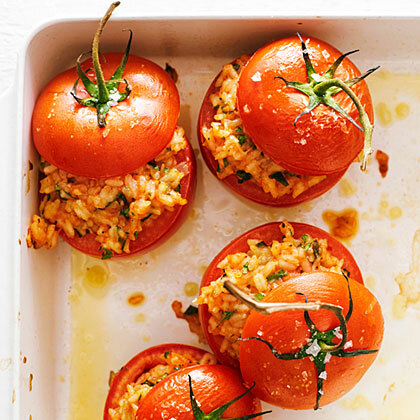 Divide risotto evenly among tomato shells, mounding it a bit, and set in oiled dish, rice side up. Brush reserved tomato tops with oil and loosely set on tomatoes. Sprinkle tops with sea salt if you like. Bake until tomatoes soften a bit, 12 to 15 minutes. Serve warm or at room temperature.